Ever notice that long list running across your Home tab in Word? That of course, is the Style Gallery, and it is where all the Quick Styles (the most accessible Styles) are housed. Trust me, those are not the only styles that Word has. Believe it or not, there are over 200! Of course, you most likely do not want to use all of them and, some of they just are not useful to you at all. Generally speaking, when I am asked how to remove specific Styles from the Quick Styles area on the Home tab, my advice is to right-click on the offending Style and select Remove from Style Gallery. Please note that this method assumes that you are working in whatever template you normally work in and most of the time, you are. If you have multiple templates (.dotx or .dotm files), you will have to do this for each template you would like to hide certain Styles in. Fortunately, you can customize your Style Gallery to be specific for each template. I have recently started working with a new firm and as such, I am responsible for creating all new templates for everyone in the firm to use. This is a classic case of nobody knowing everything there is to know about Word. We all learn new things every day – even me! So back to the templates – I created a letterhead template and I even password protected the header where I put the firm name and address so that it could not be changed by accident. So imagine my surprise wen I opened up a letter that had been saved, only to find that the header had a weird looking font! That certainly caused me to scratch my head! So I started noodling around with it trying to figure out what the deal was, because the stranger thing was that if I opened the very same document the next day, the header had the correct font! Curiouser and curiouser! So, thus far what I have deduced is that there are a couple of things at play here. Firstly I had to check to be certain that everyone who was using this, had dynamic style updating turned off. 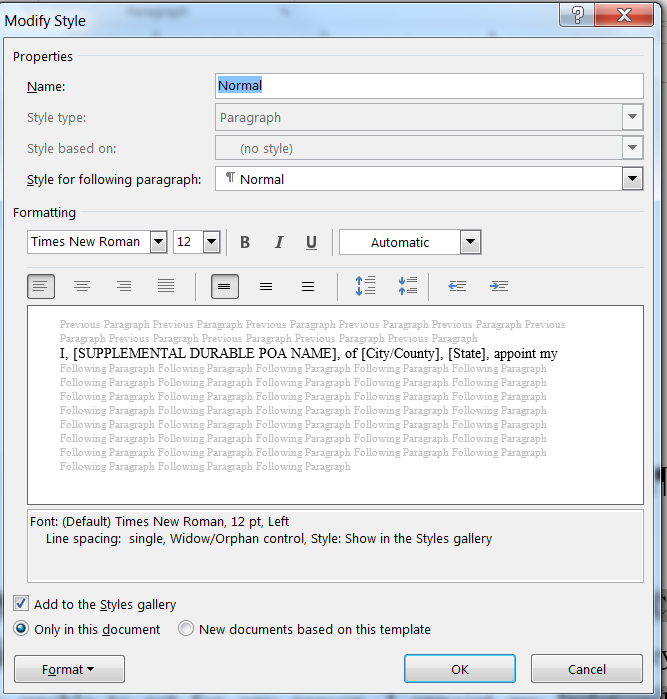 The reason for that is that this feature will cause changes to a style definition when someone applies a specific formatting change to something in the document. So, if the feature is turned on, and someone makes a change to an individual paragraph, the change is also applied to the underlying style, which will affect every other paragraph in the document that uses that style. First, be sure the Home tab of your Ribbon has been selected. At the bottom-right hand side of your Styles group, click the small icon that looks like an arrow. Alternatively, you can press ALT + CTRL +Shift + S to do the same thing. Hover your cursor over a style name in the Styles window. You should see a down arrow at the side of the style name. Click the arrow and select Modify, which will open the dialog box. Make sure the Automatically Update check box at the bottom is not selected. There is a caveat: The steps above will only affect a single style in your document. Word allows dynamic updating to be set on a style by style basis, so you will need to go through every style in your document, using the steps above. I also learned that your problem could be related to the template attached to your particular document. If your document uses the Normal template as mine did, and each user has a different Normal template, then this could affect the appearance of your document. So to rectify this, make sure your document uses a template other than the Normal template or that everyone has the same Normal template as you. Another reason for your problem can be fonts! I had to check and see if all users had the same fonts installed on their computer as mine. 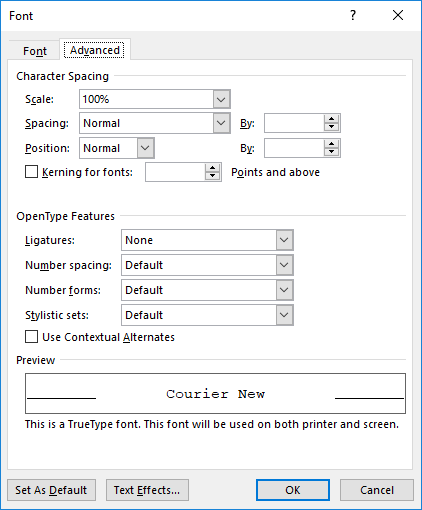 If a document uses a font that is on my computer and that document is opened on a computer that does not have the same font, Word will simply substitute a different font in its place. This, of course, can affect the appearance of your document, even when you open the document on your own computer that you created it on! So the workaround for this is to be certain that you have Word configured such that it will embed True Type fonts with your document. Click on Save at the left side. 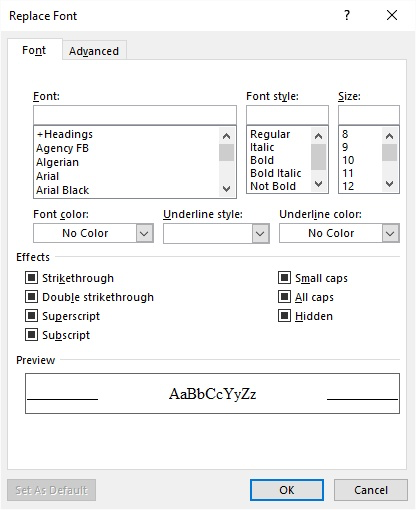 Near the bottom, make sure the Embed Fonts in the file option has been selected. To save space in your document, select the Do Not Embed Common System Fonts. So I learned quite a bit and I am happy to pass it along to you! I hope the information helps you as much as it did me! I cannot remember how many times I have been asked how to insert a check mark into a document, spreadsheet, PowerPoint slide, or even a Web page! Many subscribers tell me that this is the bane of their existence. And, so, I am going to address this today. This is not nearly so odious a task as many may think. I will now tell you how to do this over many mediums. Launch whichever Microsoft application in which you would like to insert a check mark. On your Ribbon, click the Insert tab. In the Symbols section on the far right-hand side of the Insert tab, click the Symbols icon. 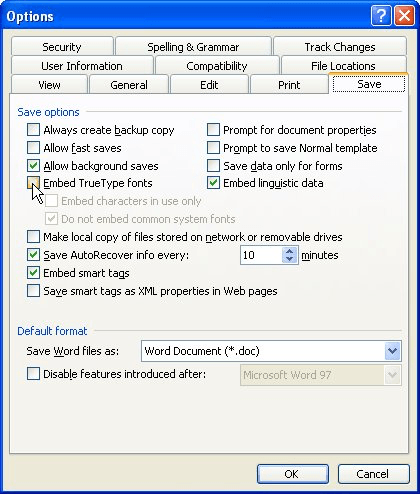 If you are using Word, in the resulting context menu, select More Symbols. If you are using one of the other Office applications, skip to the next step. In the Symbols window, click on the Font drop-down list and select the Wingdings font. Below the Font list is the Wingdings symbols that you can insert. Scroll to the bottom of the list and select the check mark symbol in the last two rows. Click the Insert button to insert the check mark into your document. On your Home tab, in the Font section, click on the Font drop-down list and select the Wingdings font. Create a check mark symbol by depressing your Alt key and keying in 0252, using your numeric keypad simultaneously. After creating your check mark symbol, change your font back to the desired font for the text in your document. Depress your ALT key and on your numeric keypad, key in 251 simultaneously. Open your program and Charmap. In the character Map window, select Wingdings as your font. Scroll down until you see the check mark (Character code 0x6FC) – the first character is a zero. Click the check mark and then click the Select button. Once the check mark has been entered into the characters to copy text box, click the Copy button. Switch back to your Microsoft program and then Paste the check box into your document. In the web page HTML source code, add one of the following extended special codes, depending of course, on the type of check mark you would like to insert. &#9745; – inserts the ” ☑ ” symbol. &#10003; – adds the ” ✓ ” symbol. &#10004; – inserts the ” ✔ ” symbol. Have you ever been working on a document and typing away and you glance up and see a copyright symbol where you really wanted to see (c)? Yes, I get that complaint a lot from users. AutoCorrect is the culprit here. But wait, shouldn’t AutoCorrect make your life easier rather than having you go back and fix what AutoCorrect did?? The answer, of course, is yes, it should, and I am going to tell you how to make it do just that! In version 2010 and later, click on File | Options. On the left-hand side, select Proofing. 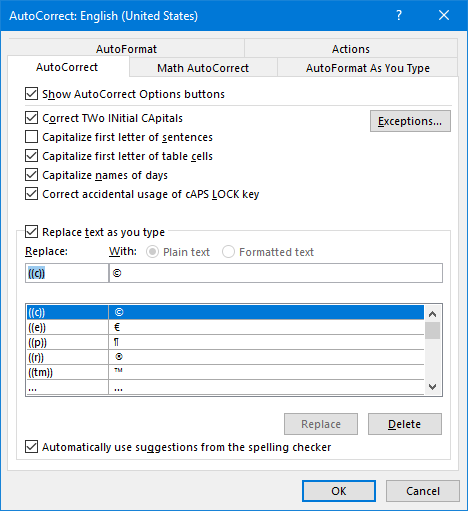 Then on the right side, click on AutoCorrect Options, which will open the dialog box for you. The first entry in the screenshot above, says to replace any instance of (c) with a copyright symbol. All you have to do is modify it to add another set of parentheses and you will no longer get a copyright symbol when you key in (c). Now you will still have an AutoCorrect shortcut for your copyright symbol, AND you can still use the letter “C” with parentheses around it without having to correct AutoCorrect! But don’t stop there! You can go through your AutoCorrect entries and make modifications wherever you like to make it behave in the way you would like it to behave. Anyone in corporate America will tell you how Microsoft Word is used extensively to create a plethora of documents. It very often can be helpful to know exactly who created a document, especially since it could be a very long time since it was reviewed last. Word keeps track of some data that can be used to help identify an author. One such piece of data that could be very helpful is the author’s phone number. Click the File tab of your Ribbon and be certain that Info is selected at the left-hand side of your screen. Click the Properties drop-down and select Advanced Properties. 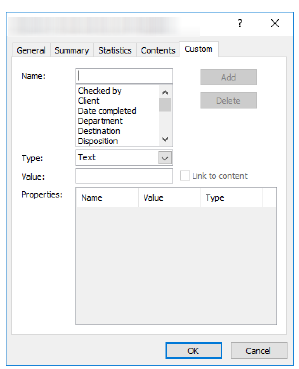 Word will display the Properties dialog box. Be certain the Custom tab is displayed. In the list of properties at the top of the dialog box ( Name control), select Telephone Number. In the Value area, key in the phone number you would like associated with your document. Close the Document Information Panel. I am not one to advertise or promote software on my blog. Having said that, I do make exceptions for software that I find helpful if not invaluable. The software I am about to tell you about is most definitely invaluable to me and to many others who avail themselves of it. As I have told my subscribers in the past, I can create five legal pleadings in less than five or ten minutes using Data Prompter. This software was created by Bill Coan and he is a wizard in my book. With this software you can create a form letter with boilerplate language and then create fields with Data Prompter within that boilerplate document. Once you are finished just save your document where you can easily find it. I save mine as templates. This is the great part – when you next open that document, a little dialog box pops up and you fill in the variables for your boilerplate document (i.e., name, street address, city, state, zip code, salutation). Just click OK and bam – your document opens and it is ready to be printed! Yes, you can even use it for letters! All you do is fill in the variables and click on OK. Believe me, this will be money well spent. I cannot impress upon you how much time and keystrokes I have saved using this program . I can now get almost twice the work done in the same amount of time. No, I do not receive any money for recommending this software to you. I just love it so much and believe in it so much that I want everyone else to know about it. Trust me, you will not be sorry! If you decide to purchase this software, please let them know that Carol Bratt sent you! Let me know how you like it too! When using huge point sizes for making signs, or even large headings, you may wonder how you can reduce leading to where the lines can be squeezed very tight, with almost no vertical space between them. In typesetting, “leading” is the term used to reference the distance from the baseline of one line of text to the next. In case you are interested, it harks back to the days when typesetters had to actually insert real lead between lines to control the vertical spacing. The baseline is the imaginary line on which the main body of the letters sit. For instance, in the following figure the baselines are shown in red, and leading is the distance from one baseline to the next. 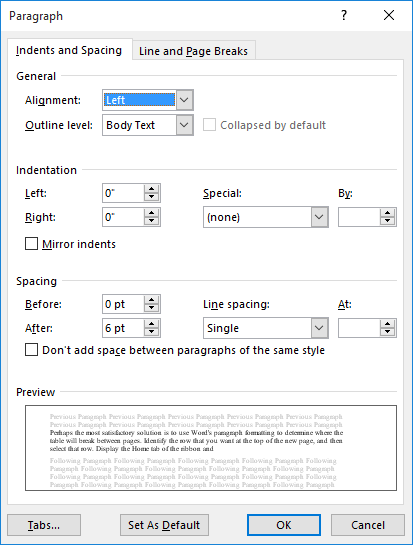 Word is not a typesetting program, so it does not use the word “leading.” Rather, it references “line spacing.” Once you select the text whose line spacing you would like to adjust, display the Home tab of your Ribbon and click the small icon at the bottom-right corner of the Paragraph group to display the Paragraph dialog box, and you should make sure that the Indents and Spacing tab is displayed. Note the Line Spacing drop-down list in the Spacing area. There are a couple of different selections you can make with this drop-down list. A lot of folks will select Multiple, and then use the At box to specify a multiplier for the line spacing. If you select 1, then Word will use normal, single-line spacing. This would normally mean 120% of the font size but can vary from font to font. You can also key in a value of less than 1, such as .8 or .6 to close up your line spacing. I prefer to change the Line Spacing drop-down list to Exactly, and then specify in the At box how many points I would like between the base lines. You will want to experiment with different values to see how they affect what you see displayed on your screen. There is a very large caveat here:I have been assuming thus far that your multi-line text on your sign is contained in a single paragraph. In other words, the only place that you actually press Enter is at the end of the paragraph, not at the end of each line. If, however, you press Enter at the end of each line, you will also want to be certain the Before and After settings on the Paragraph dialog box are set to 0. You should also be advised that with some fonts, if you decrease the leading too much, you may end up cutting off the tops or bottoms of letters as Word will try to move the lines over or under each other. Again, you will want to experiment with the settings available to you. Some folks go the extra mile, though. What they do is insert each line of their text into text boxes. Ergo, if you have 3 lines of text on the sign, you would have 3 text boxes—one for each line. Format the text boxes so they are transparent, have no fill color, and do not have a border. You can then move these text boxes as close to each other as you like, even overlapping them, as necessary. Lastly, if you would like to use some really funky text in your signs, you may consider using WordArt to create the text. Basically, you are creating text that Word treats as if it is a graphic. This allows you to get your lines of text very close to one another. This tip applies to Microsoft Word 2007, 2010, 2013, 2016, 2019, and Word in Office 365. Fields are very handy when working in a document—they allow you to place dynamic information in your documents. Sometimes you may want a field to remain static (i.e., not change). You can do this by selecting the field and pressing Ctrl+F11. This locks the field so it will not update from its current value. If you have a lot of fields in your document, and some of them are locked, you may want a method to quickly discover which ones are locked. Unfortunately, Word has no special feature that will allow you to search for locked fields, however, you can create a macro that will search them out for you. The following macro, FindLocked, starts at the beginning of a document and finds locked fields. It selects each locked field, in turn, and asks you if you want to continue searching. Many thanks to Allen Wyatt for the macro in this article. This tip applies to Microsoft Word 2007, 20210, 2013, 2016, 2019, and Office 365. One of my subscribers had a document in which footnote references were in the wrong place relative to the period at the end of a sentence. She wanted to search for all instances where the footnote reference is before the period and move it to after the period. In some instances, the period may be followed by a quote mark, in which case she would want the footnote reference after the quote mark. Key in the following into the Find What box: ^f.” (caret, f, period, and quote mark). Key in the following in the Replace With box: .”^& (period, quote mark, caret, and ampersand). Key in the following into the Replace With box: ^&# (caret, ampersand, and pound sign). Key in the following into the Find What box: .”# (period, quote mark, and pound sign). Make sure there is nothing in the Replace With box. Key in the following into the Find What box: .” (period and quote mark). Click the More button, if it is available. Put your cursor in the Replace With box. Click Format and choose Font to display the Replace Font dialog. Be certain the Superscript check box is cleared. Close the Find and Replace dialog. This may seem like a lot of steps, but it moves along pretty quickly. Steps 1 through 4 basically replace any instances of “reference period quote” with “period quote reference period quote.” This is necessary because you cannot use the ^f code (which finds a footnote reference) in the Replace With box. Instead, you use the ^& code to replace what you find with what you searched for. There is, however, one more operation that needs to take place and it is done in steps 10 through 16. After all the previous steps, the period and the quote mark are left not as normal text, but as superscript, just like the footnote reference. The purpose of steps 10 through 16 is to change them back to regular text. Remember, these steps only take care of the initial change “reference period quote” to “period quote reference.” You still need to go through similar steps to change “reference period” to “period reference.” In fact, you can use the same previous 17 steps, but leave out any quote marks from what you search for and replace with. There is actually an even shorter way of doing the replacements, using wildcard searches. Press Ctrl+H to display the Replace tab of the Find and Replace dialog. Be certain the Use Wildcards check box is selected. Key in the following into the Find What box: (^2)(. [“”]) (note there is both a straight quote and smart quote within the square brackets). Key in the following in the Replace With box: \2\1 (backslash 2 backslash 1). Key in the following into the Find What box: (^2)(.) (note that the only difference between this and what you searched for in step 4 is that the square brackets and quote marks are missing). Close the Find and Replace dialog . These steps take care of all instances of “reference period quote” and “reference period.” You should also be aware that these steps, using the wild card search, will also change the order of any endnote references within your document. So, if your document has both footnotes and endnotes, and you do not want the position of the endnote references modified, you should use the first 17-step process instead of the wild card search. Once a font is designed, a certain amount of space is designated for inter-character spacing. This spacing determines how close adjacent characters will be to each other. Unfortunately, not all characters will appear the same width when read on a printed page. Depending on the characters, this may cause an illusion that characters are spaced too far apart, when in reality they follow the standard spacing conventions for the typeface. This problem normally appears when the left character in a pair has a stroke (a line) that travels diagonally from left to right. In most cases, this type of kerning will do nicely. There may be times, however, when you would like to manually adjust the kerning between two characters. (i.e., you may want to create some special effect for the character)s.